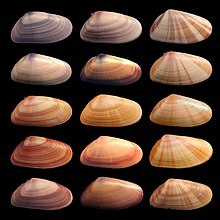 Donax variabilis, known by the common name coquina, is a species of small edible saltwater clam, a marine bivalve mollusc in the family Donacidae, the bean clams. It is a warm water species which occurs in shallow water on sandy beaches. This species occurs on the east coast of the United States, from Virginia Beach, Virginia to Florida including East Florida, West Florida and the Florida Keys. The maximum reported size is 19 mm. The exterior of the small shell of this species can have any one of a wide range of possible colors, from almost white, through yellow, pink, orange, red, purple, to brownish and blueish, with or without the presence of darker rays. This species lives from the intertidal zone of sandy beaches to a depth of 11 m.
The coquina is edible and is used to make broth. Some people collect the colorful shells to use for crafts.